Bangus (milkfish) is one of my favorite fish to eat. As a matter of fact, I usually prepare more than one bangus dish at home every week. I don’t only love the taste of bangus, but I’m also after the health benefits of bangus. Bangus is rich in protein and omega-3 fatty acids. As we all know, omega-3 fatty acids are good for the heart. Consuming bangus on several occasions each week is the reason why I was able to raise my HDL (good cholesterol) level. One of my favorite bangus dishes is Fried Bangus with Tausi. Preparing this delicious fish dish is super easy. 1. Heat oil in a pan. 2. Fry fish steaks until lightly browned on both sides. Set aside. 3. Heat oil in a skillet. 4. Saute garlic then onions then ginger. 5. Add tomatoes and continue sautéing until tomatoes are tender. 6. Add black beans. Mash black beans to let its flavor come out. 8. Season with salt and pepper. 9. Simmer for 3 to 5 minutes. 10. Add seared fish steaks. 11. Let it simmer until the sauce thickens. Incidentally, it took me a long time to take a picture of this bangus dish. That’s because my 5-year-old son was insisting he’d do it. He actually thought our Canon S95 camera is one of those boys toys from Deals Direct that he can play with anytime. 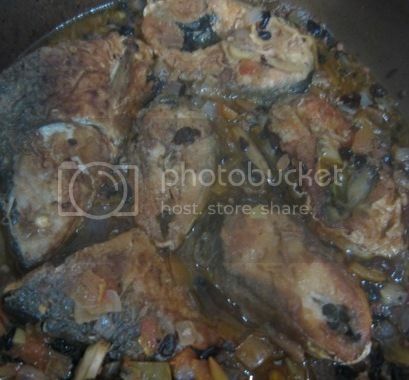 This entry was posted in Filipino Cuisine, Home-cooked Dish. Bookmark the permalink.